A few weeks ago, I had the chance to visit Northwest Arkansas. While there, I had the privilege to meet up and hang out with the guys from Basic Brewing, my favorite brewing podcast and video podcast. You may remember last year I had a chance to chat with the guys about the spontaneous homebrew I had made. 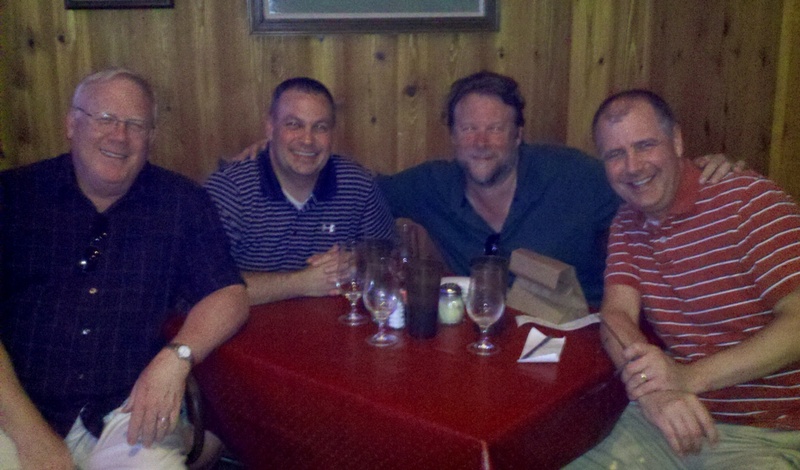 To begin the evening, we met up at Tanglewood Branch, where I had a chance to finally meet James, Steve, and Andy in-person. While at the pub, I had a chance to try the porter made by the owner/brewmaster, J.T. Wampler. After we finished our beers, we decided to head over to the Fayetteville square and enjoy some pizza from Tiny Tim’s Pizza and West Mountain Brewing Company. West Mountain was a quaint restaurant that had been a pizza place for some time, but just began brewing at the end of 2011. While there, as we were enjoying the pizza, I tried the Rye Pale Ale and the West Mountain Saison, with the saison being my favorite of the two. After we had finished our meal, Steve decided to call it an evening, but James, Andy, and I went back to Andy’s home. James had brought a few of the beers he had purchased while at the Great Taste of the Midwest the previous weekend in Wisconsin. Additionally, I also wanted to see Andy’s automated brewing setup he had (along with the barrel he had just purchased; see the Basic Brewing Radio archives for more info). While checking out the brewing setup, we split the Berliner Weiss James had just made (7/26/2012 episode of Basic Brewing Radio), along with a couple of New Glarus beers – the Thumbprint Saison and the R & D Sour Ale. After a while, we realized it had gotten late, and we decided to call it a night. Over the course of the evening, I had a chance to sample some great beers and enjoy great company. I hope the next time I get a chance to visit Fayetteville the guys are available again, so we can have another great time.